This is a remarkable map of a remarkable event. 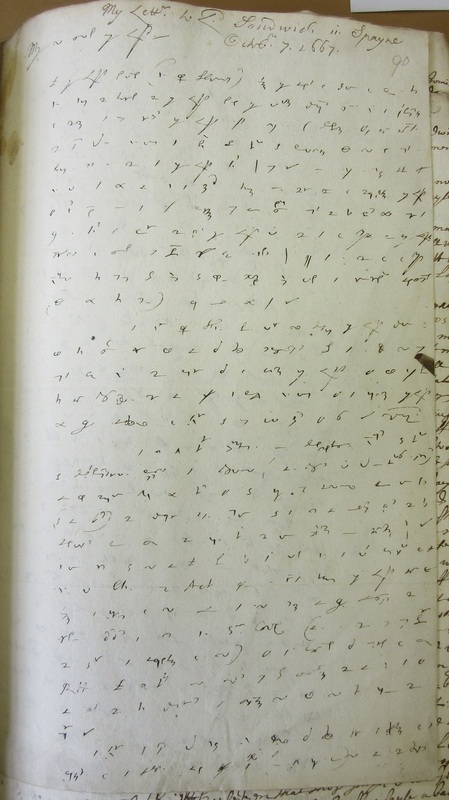 Interleaved amongst Naval papers and letters to and from Samuel Pepys in a volume of manuscripts is a drawing by another noted diarist, John Evelyn, of one of the few examples of enemy action on British soil since 1066, the attack on the River Medway in 1667 by the Dutch. The volume of papers is part of the Rawlinson collection. Antiquary Richard Rawlinson (1690-1755) donated to the Bodleian over 5,000 manuscripts and nearly 1,800 books on such subjects as theology, literature and history. Evelyn was a contemporary of Samuel Pepys and his diary, which he wrote for most of his life though not to the detail of Pepys’s shorter work, was first published in 1818. 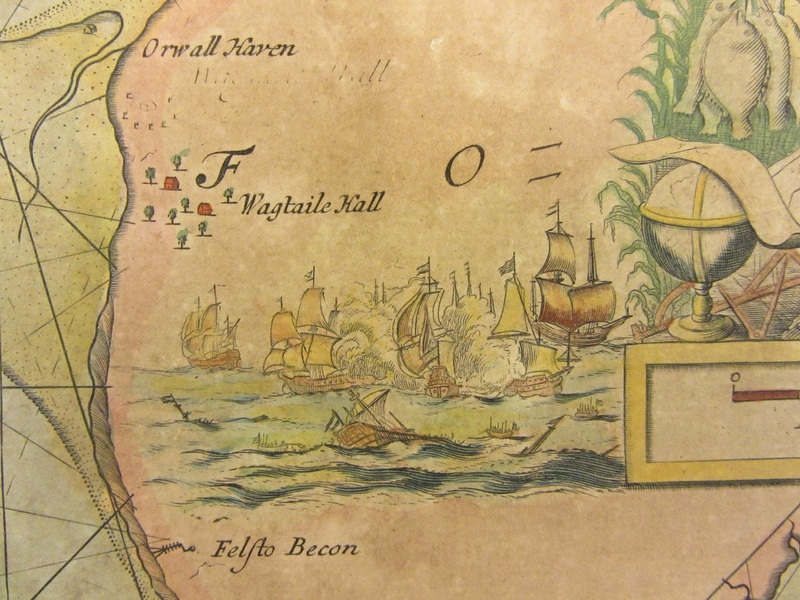 This map by Evelyn is included in the collection of Pepys manuscripts because of Pepys’s role in the Navy, first as an administrator and then, from 1673, as Secretary. The raid was part of the Second Anglo-Dutch War, fought between the two nations from 1665 to 1667 to gain the upper hand in trade and World dominance. 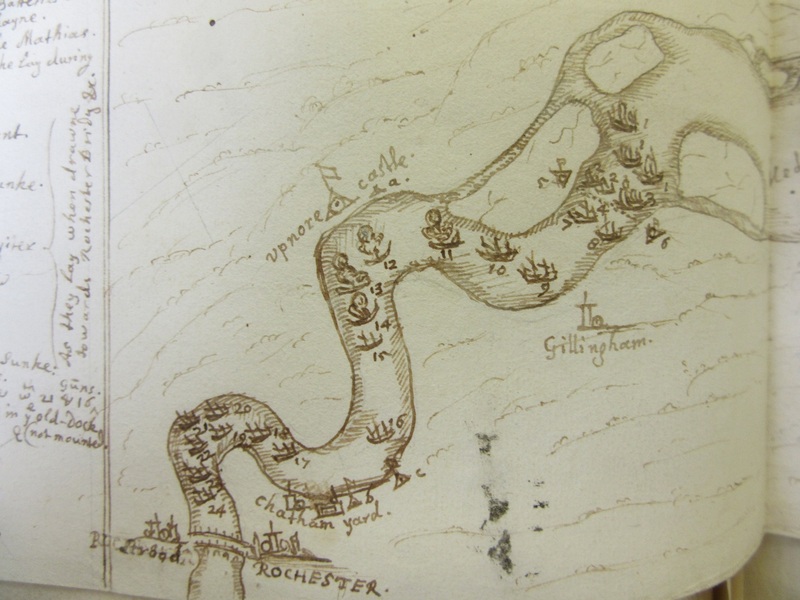 Between the 11th and the 13th of June Dutch ships sailed into the Medway, firing on Chatham and Sheerness and sinking a number of British ships. This is an extract of the area around Rochester and Chatham Yard. The dotted line between ships 2 and 3 and 7 and 8 is a heavy chain laid across the river to prevent the Dutch breaking through, a measure which failed, allowing the Dutch fleet to sail on and attack the British fleet at will. Ships 12 to 14; the Royal Oak, the Loyal London and the Royal James, were all burnt while the flagship, the HMS Royal Charles (10) was captured and towed back to the Netherlands. The map is a sketch in pen and ink and there is a letter from Evelyn to Pepys with the map. Dated the 20th of June the letter starts ‘I am heartily ashamed I could not performe yr command before now. It was Friday ere I could possibly get home, and find I am here. 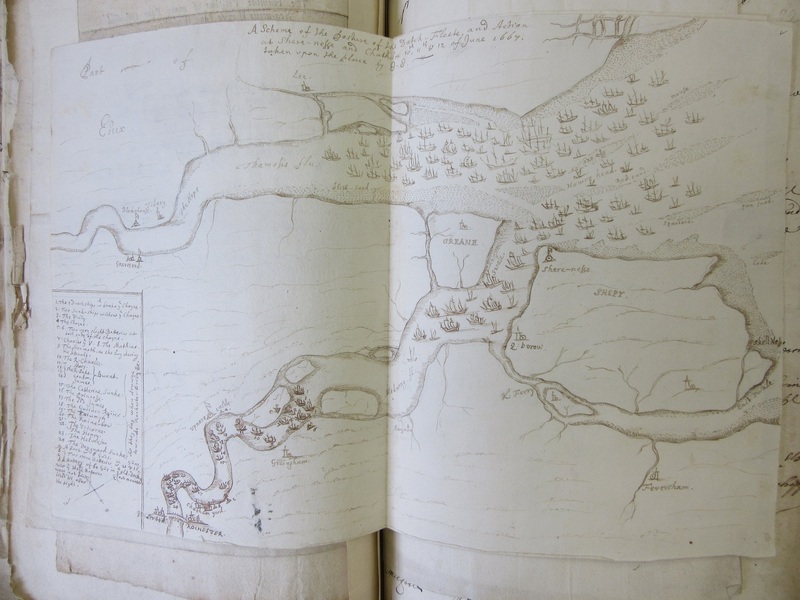 I have been so afflicted with ye gripping of the guts that I was not able to bestow the pains intended on the scheme I send you…’A later map of the Essex coast, made in 1686 by Capt. Grenvil Collins, is dedicated to Pepys and features as part of the cartouche a small picture of a battle at sea (posted on this blog in January 2016). A few pages after this map is a letter Pepys wrote to the Earl of Sandwich when the Earl was Ambassador to Spain in 1667. Pepys often used code when writing his diary, and it is interesting to see that this skill was also important in his official role. Lord Sandwich was a friend and supporter of Pepys. Sandwich died on board ship during a future War with the Dutch in 1672. This entry was posted in Uncategorized on 6 February 2019 by stuart.